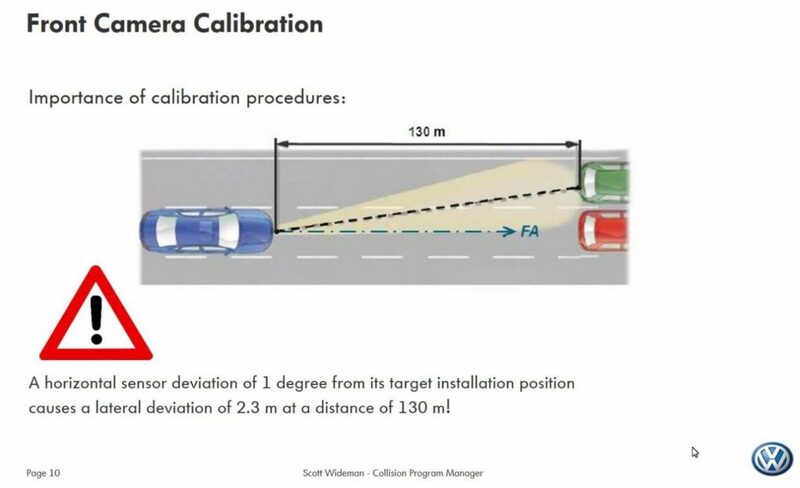 Volkswagen Canada collision program manager Scott Wideman said this month the 2019 Volkswagen Arteon will be able to autonomously change lanes and stop the vehicle in the event of an unresponsive driver. The remarkable Emergency Assist feature keeps tabs on if the driver hasn’t used the accelerator, brake or steering wheel for a while. (It’s possible to get an Arteon with both automatic lane-keeping and adaptive cruise control, so this isn’t as implausible as it sounds.) If nothing’s happened, the Arteon tries to get the motorist’s attention. The system also jolts the seat belt. If the driver can’t or won’t do anything, the vehicle will pull itself over to the slow lane, hit the flashers and stop using the Arteon’s autoparking capabilities. The Arteon taps Side Assist and Lane Assist to ensure it can change lanes safely; that combination under normal circumstances monitors blind-spot traffic and autonomously prevents the car from merging into someone else. “You see a level of autonomy happening with the Arteon,” said Wideman, who on March 14 showed a VeriFacts Guild 21 call audience a video demonstrating the feature. He said the question becomes the repairer calibrating the associated sensors correctly and doing what the manufacturer requires to maintain safety. “Very, very important,” Wideman said. A failure to properly restore the vehicle and the relevant technology could have severe consequences upon other drivers if the Arteon is incorrectly perceiving the world. For example, Wideman said earlier in the call he had engaged in “many conversations” with repairers and insurers about why a four-wheel alignment was necessary in a particular case. The Volkswagen’s camera assumes the correct thrust angle is in place. If it the alignment isn’t done to deliver the right baseline, “we have a system that wouldn’t be functioning properly,” Wideman said. He presented a slide demonstrating how a front-facing camera off by a single degree would be perceiving something 7.55 feet to the side as right in front of it at a distance of 426.5 feet. That might seem far away, but remember that a car going 70 mph travels 103 feet every second. Some Volkswagen technology can self-calibrate, while other equipment can’t, according to Wideman. You have to read the repair procedures, he said. Wideman’s jurisdiction isn’t technically the U.S. However, his presentation’s information was meant to be applicable to America, Guild 21 call organizer and former longtime State Farm employee George Avery (Avery Knows) said at the beginning of the call. Both the U.S. and Canada share the same Volkswagen repair literature, Wideman said. Only minor vehicle differences existed, he said, providing as an example the Canadian requirement that all cars have daytime running lights. 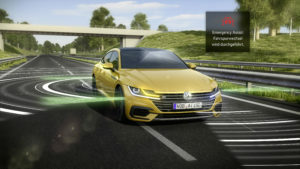 The Arteon appears to be one of the first examples of a vehicle actually changing lanes itself to protect an incapacitated driver. Tesla did not respond to a request for comment on whether the system could change lanes by itself, without human interaction. Cadillac’s Super Cruise actually lets the driver take the hands off the wheel on more than 100,000 miles of roads, though the motorist is still responsible for monitoring the vehicle and its safe operation. However, those Cadillacs also only stop in the lane it’s in should the driver be unresponsive, a spokeswoman Tara Kuhen confirmed. “The Super Cruise system has a series of escalations to alert the driver in the event that he or she needs to take control of the vehicle,” she wrote in an email March 15. “These escalations start with visual prompts and progress to audio prompts to take back control. If the driver does not respond to a series of alerts to take control of the vehicle, the Super Cruise System will bring the vehicle to a safe, controlled stop (in the lane that it is in), turn the hazard lights on and call OnStar for help.